The Pixel XL is a phone full of superlatives but disappointing when it comes to sheer value for money or salient features. Sooner rather than later, Google’s Android and Apple’s iOS will look like twin ecosystems. Google started by opening up the market and offering, to paraphrase the words of tech guru Richard Stallman, the bazaar as an alternative to Apple’s monolithic cathedral. But things are changing and Pixel, Google’s first true exclusive smartphone, is a seminal point in that journey. HTC built the phone but Google, for once, pulled the screen, using the Taiwanese company as an ODM (ironically where HTC started life with O2). The Pixel and the Pixel XL, its bigger brother, are easily the most expensive mainstream Android smartphones to hit the market. The cheaper version of the Pixel XL, with 32GB of storage costs £720 while the 128GB model will cost you a staggering £820, eroding the myth that Android smartphones are cheaper than Apple’s iPhone. Back to basics is what the Pixel XL seems to be about; as a reminder, Google calls this a phone rather than a smartphone and doesn’t try any new exciting tricks with the hardware. The hardware is reasonable without being spectacular. It has a 5.5-inch, quad HD display, a 12.3-megapixel camera, a fingerprint sensor, a quad-core Snapdragon 821 system-on-a-chip, 4GB of LPDDR4 RAM and a 3,450mAh battery. Clearly, if sheer brute force that you’re after, there are smartphones (like the OnePlus 3T) with better hardware out there (or thinner girth or tinier bezels). No, what Google is trying to do with the Pixel is position it as the pace setter. Google managed to do it earlier on with the Nexus range and gradually, over the years, positioned itself as the purveyor of the best Android smartphones without anyone apparently complaining. (So successful was Google that Microsoft followed suit with the Surface range and no one even blinked an eye). But the hardware is only part of the story and while the Pixel has best-of-class hardware, it is not where most of the added value can be found. Which is how Pixel differentiates itself from the competition, more on that later. But back to the hardware. The phone is a tad too big for my liking; it is full of curves and rounded edges which makes it great for those with big hands but not for the rest of the population. Its textured back makes it less likely to slip down like some other premium models we’ve seen before. The fact that Google went for an even bigger phone in the shape of the Pixel XL only highlights the need, for a smaller version of the Pixel, a smaller 4.5-inch version would have been perfect for those looking for an alternative to the Sony Xperia Z5 Compact. Business people will love how smooth and uncluttered the user interface is on Android Nougat. This phone has adopted a minimalist scheme (let alone for the G at the back) which will please those looking a conservative design. 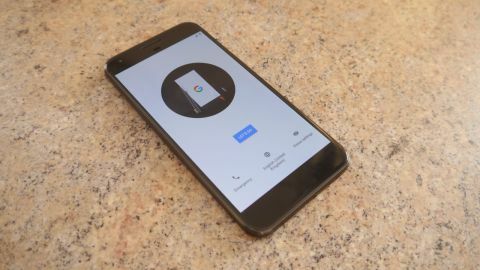 The fingerprint reader worked without a hitch and, this being a Google phone means that it will get updates including security ones as soon as they’re out of the developer oven. Clearly this phone aims at the premium end of the market with a full glass and metal body that feels and looks premium. Perhaps the weakest point of the Pixel XL is its battery. At 3,450mAh, the internal, non-replaceable battery was always going to be a bit of an issue. A big, high resolution screen combined with a powerful system-on-a-chip and a large amount of memory means that sacrifices had to be made somewhere. Even then, Google claims that the phone offers up to 26 hours talk time and up to 456 hours on standby. The front facing camera on the device is an 8-megapixel while the rear one is a 12-megapixel one with 1.55um big pixels and an f/2.0 aperture to capture as much light as possible. The headphone jack is still there with NFC, 802.11ac Wi-Fi, fast charging capabilities (thanks to Qualcomm's technology) and a Gorilla Glass 4 layer covering the AMOLED display. There’s even a quick switch adapter that makes transferring your content from an iPhone or Android device to the Pixel XL far easier. Software and services are the focal points of Google’s marketing campaign – rather than hardware. So there you have the answer about how Google wants to squash the competition. Assistant, Photos with unlimited cloud storage, Smart Storage, Duo and Allo seamlessly work on the Pixel XL. And don’t forget that the phone was also the first one to get Android 7.1 (Nougat) in its purest, uncompromised version. Everything worked as it should; updates, transitions, localisations, browsing. A world apart from models like the Lenovo ZUK Z2 which may sport a much lower price tag and much better hardware but leaves the user frustrated with a sub-optimal software experience. A word about the Daydream View VR headset from Google, which you get for free with this device. At £70, this is probably the best value-for-money headset on the market and is the perfect complement for the Pixel Phone should you want to experience with VR either for work or for leisure. The Pixel XL is an exquisite phone but it is just too expensive for most and Google doesn’t carry the same cachet and aura as an iPhone, whether Google wants it or not. We would have loved a smaller version of the Pixel for those who have smaller hands. The biggest downfall though of the Pixel XL is that there’s no particular hook, the sort of unique selling point or killer feature that the likes of Samsung or Apple have for so long came up with. We’d love to see an active stylus pen down the line or a series of business accessories – similar to the HP Elite X3 - to confirm Google’s ambitions in the enterprise vertical as well as stereo speakers and some sort of waterproofing.